Ah, white asparagus. In Germany it is known as spargel and called the ‘royal vegetable’. It was usually available for only six weeks –– May to the feast of John the Baptist on June 24th , but new sources have extended the old time frame and made for a longer season—mine came from Peru! In an article by Amy Rosen, I read that during the cutting time in Germany they eat them a thousand ways and relish every ivory morsel… eating nearly a pound per serving per person. What to do with a royal vegetable??? The minute I saw the ingredient I knew what I wanted to make. White asparagus in pastry was one of those indelible taste memories from my past that remained firmly fixed and waiting to be made one day. This blog is nothing if not an excuse to rekindle glories of past flavors… it isn’t called Lost Past Remembered for nothing. I had this dish a lifetime ago on an early trip to Paris. We discovered La Fermette Marbeuf in the 8th Arrondisment quite by accident on a walk. Its story is like a fairytale. 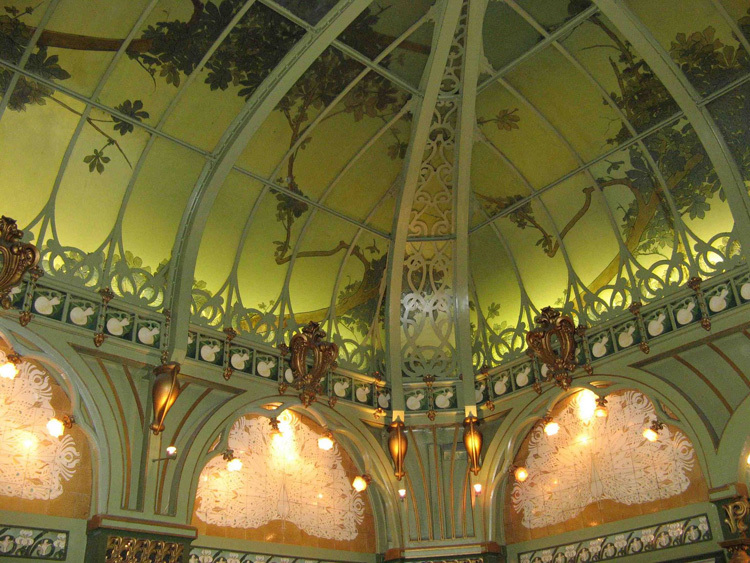 It was an Art Nouveau wonder that had been covered up for nearly 80 years when the style had become unfashionable. I am mad for Art Nouveau and for long lost treasures found so this was pure magic for me. It was a whirlwind trip that had me mad with pleasure, crawling over Paris’ Art Nouveau treasures and this dish sits happily ensconced in my brain as a taste of a very great visit: puff pastry base, white asparagus lacquered with a meat glaze infused with sauterne atop a custard with a bit of foie gras in the bargain… that is how it now lies in my memory at any rate. Did it live up to the taste I remember??? Yes ––it was that same ethereal pastry with a thousand crisp layers as delicate as Lalique dragonfly wings that shatter like old glass when you bite into them. In that bite you taste the sweetness of the wine in the glaze and the warm coverlet of rich creamy custard above and wine-scented foie gras nestled below. This dish elevates the asparagus to royal stature indeed. To make it I did my own puff pastry (recipe below) but it would work with bought pastry if you are pressed for time (making your own isn’t hard and much cheaper... even using organic butter!). However, I must say, the duck fat in the recipe works magic and created an enormous loft thanks to many turns, and I wanted to go the extra mile for this dish… honor the memory. In that spirit, I used Hungarian Esszencia Tokaji instead of sauterne. I was lucky enough to have tiny, 100ml bottle of the ’93 from my friends at The Rare Wine Company (Mr. Parker rated it 99… it’s that good… a thick syrup redolent of apricots and celestial nectar). It’s a wine I’ve wanted to try since reading about it in college in my favorite antique (1932) wine book, The Romance of Wine , where the 1811 was described as having “a wonderful aftertaste that spreads over palate and gullet like a peacock’s tail. It might be compared, almost without exaggeration, to the harmony of sunset colours. The bottle can be opened and left indefinitely without apparent injury to the wine which has a radium-like power of emitting particles of perfume without exhausting itself.” It is probably the most celebrated wine you’ve never heard of –– but I’m going to change that. The very informative Tokaji site said, “Hand-selected botrytis -affected berries, which are later needed for Aszú preparation, are gathered into a keg and kept in it for a couple of days before the Aszú paste is prepared. Due solely to the berries’ own weight alone, some highly concentrated juice of the finest quality will have accumulated on the bottom of the keg. This is the free-run juice that Essencia is made from. One keg containing 25 kilograms of over-ripe Aszu berries produces only between 1 and 1.5 liters of Essencia.” It ferments for 4 years and the resulting wine lasts hundreds of years… it was thought to be immortal and have curative benefits. There was a claim it could restore an invalid to good health! In 1703, Francis the Prince of Transylvania gave some Imperial Tokaji to Louis XIV of France. When Louis shared it with his beloved Madame de Pompadour, he said it was “Wine of Kings, King of Wines” (Vinum Regnum, Rex Vinorum) and the compliment is still repeated. 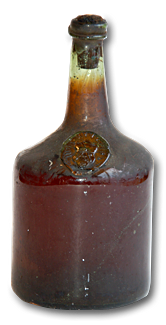 Queen Victoria was a huge fan and Emperor Franz Josef sent her a bottle for every month she lived on her birthday. The last year of her life she received 972 bottles! It was a favorite of Beethoven, Lizst, Shubert, and Voltaire. 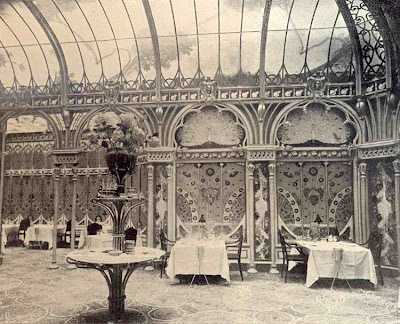 Napoleon, Gustav of Sweden, Peter the Great and Elizabeth of Russia all were fond of the wine. Even the infamous enjoyed it… Hitler celebrated his marriage to Eva Braun with Tokaji. It really is a cool wine with a remarkable story… had to use it for this dish. The spectacular foie gras, demiglace and duck fat for the pastry came from D’Artagnan and can be ordered online by clicking the links. This is one of those dishes that will knock your socks off… I made my dream version but you can put this together easily if you buy puff pastry. It was good hot or warm and could also be made in smaller sizes or doubled for 4. 2-3 T St Andre or any mild triple crème cheese without the rind. Steam the Asparagus over boiling water…. 3 minutes and remove. Cool. Take the square, cut a 1” frame into the pastry, making sure not to cut all the way through… use a very sharp knife. Pierce the middle section with a fork all over. Place a piece of parchment not much bigger than the pastry (if it is too big it drags a side down... like mine did!!) on top and cook for 10 Min at 425º on the upper half of the oven, lower the heat to 375º, remove the paper and cook another 7-10 minutes and remove. When cooled a little, take out the mid-section if it has risen high in the middle and stick it back in the oven for another 5 minutes to dry out the inside… remember you are going to cook this more so it shouldn’t be dark…. Make sure your oven is accurate. If it has stayed low (ie the pastry middle has not risen wildly like mine did! ), put it back for 5 minutes if it is not a pale gold. Sauté the foie gras in 1 T butter with a sprinkling of salt and pepper. Brown on both sides. Add 1 T esszencia or sauterne to the mix and remove. Reduce the Demi glace to a syrup, about 3 T –– take care, it does get thick quickly after taking a long while to start reducing. Remove from the heat and add 2 T Esszencia or sauterne. Combine 1/2 c cream and 2 egg yolks, pinch nutmeg, pinch salt. Smear St Andre cheese over warm pastry. Measure your asparagus to fit into the shell and set aside. Put foie gras over the bottom of the pastry. Pour the custard over the foie gras and cook for 10 minutes, remove. Place the asparagus over the top, cook 10 minutes, remove. Ladle the demiglas over the top and put in the 375 for 20 minutes or until the custard is set and the asparagus has just begun to brown. Make the dough as you would pasta, knead very sparingly and refrigerate. Make the dough into a rectangle and put the butter in the center in a diamond... fold the dough around it like an envelope, bringing the 4 outer points to the center of the butter. If it’s hot, chill. Otherwise roll it to a rectangle and fold it like a brochure and chill ½ an hour. Roll it out and do it again 6 times, resting for ½ an hour in the fridge each time. I left mine overnight after the last turn and rolled it out the next day. Announcement: For the first time since beginning this blog, I am going to take a break for a few weeks. I will be concentrating on my writing and working hard. I'll miss the blog and my blogging friends since I will not be able to visit all of my favorites as often as I would like during this time... No distractions! I'll be back soon, promise!!! This is absolutely unbelievable! 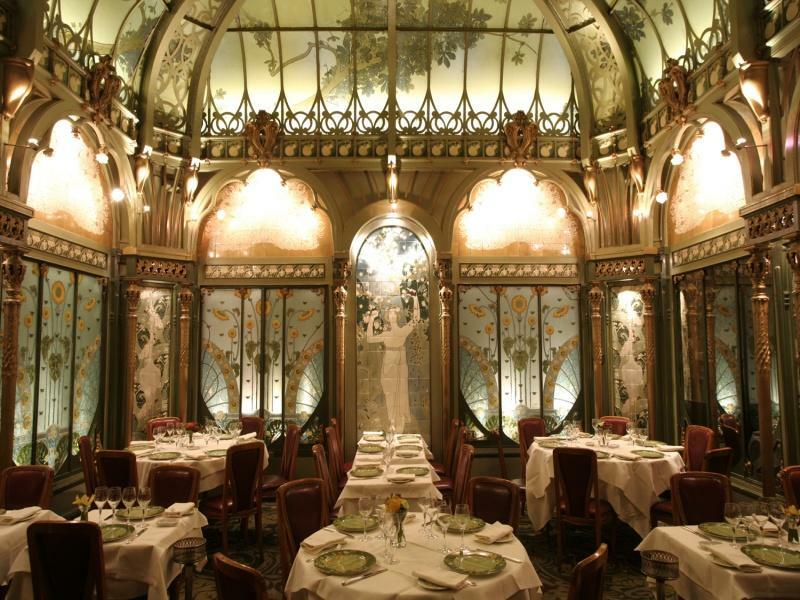 The dish matches the tokay aesthetic, matches the nouveau setting. Remarkable. And I think I'm going to try it. Thanks. Is that not Louis XV you have pictured up there? Wow, this is just beautiful! It sounds just as delicious as it looks. I love the violet and garlic chive garnish. Very nice! I'm singing!! Oh- so heavenly! I feel like you can actually see ghosts in those Paris pictures.. And the way you described the flavors?? Oh- I have to figure out how to make GF puff pastry. And the violets on top- just lovely. You make me miss Paris and my friendly butcher's foie gras. Enjoy your break- I will be looking forward to reading more from you soon! Thanks to Ken for pointing out the picture... 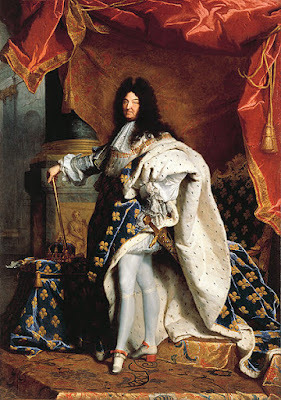 I now have Louis XIV not Louis XV! They are so similar... the fabric and the artist are the same!!! We are on the same wavelength. I just returned from Budapest last night with a bottle of Tokaji tucked in my bag. Of course, it is not up to snuff with your bottle! 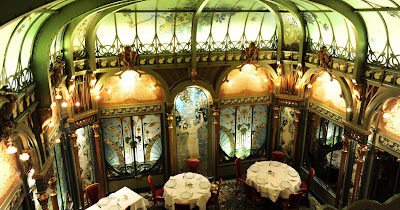 The Four Seasons Hotel in Budapest is a remarkable example of Art Nouveau. You'd love it. White asparagus is one vegetable that US Customs and Agriculture allow to be brought back from France. Tis the season. I think I may have to give this tart a try, no arm twisting needed here. 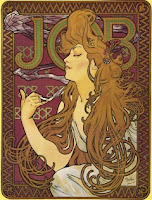 It is amazing how you can make this look Art Nouveau. Beautiful! Thanks again for the information and inspiration. Thank you for the wonderful welcome message you left me. And wow what an impressive post you have here. 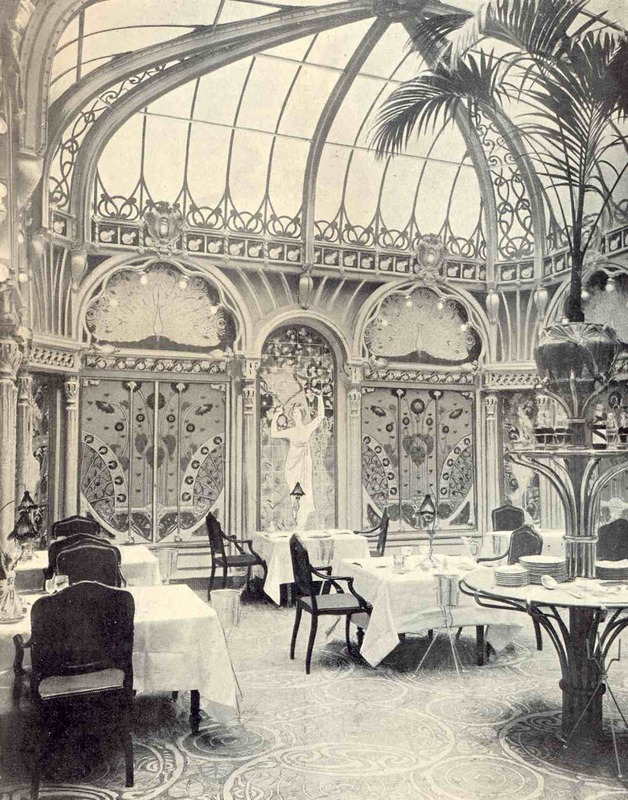 Just a wonderful Art Nouveau parisian trip, I learned so much. And your recipe...so regal indeed, it is stunning. Deana, what a gorgeous creation! I love that you made your own puff pastry (and with duck fat!) and with foie gras and St. Andre cheese, this is totally dreamy! Fantastic! This is wonderful. I love how it looks. I love pastry. Exceptional. Deana... your tart looks amazing...I lived in Germany for 6 years and always looked forward to the short Spargel season. During that time they are everywhere, every restaurant, every home. I have lovely memories of preparing them. I will miss you...have a good rest. This is such a gorgeous, elegant dish. I love your garnishing touches of violet and wild garlic chives...they really make the pastry come to life! Hope you have a very productive break...I will be eagerly awaiting your return! OMG. This is beyond I expected with white asparagus. Now I really hope I won't embarrass myself with my dish among the cooking group members! Also, with my silly thought, I wonder if they will serve white asparagus at Prince William & Kate's wedding. Didn't know what it's a royal vegetable until now. Good to know! Good luck with your writing, Deana! We will miss you and your wonderful post such as this. Your asparagus in puff pastry looks as beautiful as La Fermette Marbeuf. Smashing. Very impressive 5 Star dish for certain. Artfully presented. Mind-blowing flavor combo. Fantastic tribute to your memories of this dish, La Fermette, and the incomparable beauty and grace of Art Nouveau design. Duck fat, foie gras and the most celebrated wine I've never heard of could only result in a taste sensation! Bravo! So beautiful and I love the violets garnishing. They are perfect, too. I will miss you but sometimes a break is needed. You have worked so hard on this blog. Good luck with the book. Will look forward to your return. What an absolutely gorgeous pastry! The lavender is such a nice touch! Thanks so much for thinking of me for the Duckathon! Unfortunately, I'm not available tomorrow! Ok: Duck fat in puff pastry. GENIUS. This I am going to try. And so perfect for a savory application. This dish really does capture the feeling of art nouveau ... your food is always so evocative. I had much less fancy Tokaji in Hungary ... so inexpensive it makes you cry to look at the price of an imported bottle over here. Sigh. What a great post. This is edible art--I am so making this if I can find white asparagus. I might have to grow them. Beautiful! I just tasted white asparagus for the first time this week at Bar Boulud. It was part of an aioli platter. I much prefer your way of using the royal veggie though. Your floral touches make it an absolute visual masterpiece, truly a credit to the lovely interiors of La Fermette Marbeuf. O.K., now this warrants CLOSE examination and study of the pâte....I L.O.V.E. PÂTE FEUILLETÉ but my first attempt was a disaster! Little did I know that (well, according to one of my FRENCH dinner guests on that day) that our flour here in the states is a bit heavier than French flour therefore, this dough requires a skillful, seasoned DOUGH MAKER! I was young, new to cooking and I think I have learned a thing or two about kneading and dealing with COLD BUTTER and such sensitive doughs...but the results, OMG. Now for your version here. I am guessing by your expertise that the duck fat has GOT TO BE DYNAMITE in this and makes it light and buttery. Deana, you rock. You set the kitchen ON FIRE, WOMAN!!!! And I love white asparagus. I have a German friend that makes hers with ham in a sort of cream sauce!!!! Well dearest one, I want to thank you for coming to my faery tale post. You certainly are a certified KITCHEN FAERY, for I believe you work wonders chez toi. Let us outdo ourselves and make this ridiculously cruel world a better place. and to think I have fois gras in my fridge right now! I love the art history and the interpretation in the dish. magnifique! My first taste of white asparagus was in Paris years ago. What better place, I ask you? I'm impressed you made your own puff pastry! And loved reading about Tokaji. What a marvelous aftertaste description. Have a lovely break from blogging, Deana! White asparagus really is a treat. I got to know it well during my Vienna years, where it is very popular with Hollandaise (of course!) Now this treatment looks so incredibly elegant. I think you are an amazing writer.I have just started listening to some Nathalie Goldberg CDs my friend lent me re writing..Your post made me think of this.. I made puff pastry once and enjoyed the mindfulness of it..
Oh that resto looks amazing as your adorned tart. I love asparagus..the look the taste. I think you found the perfect way to showcase white asparagus - a rarified dish for a rarified vegetable. The restaurant in Paris looks just amazing. Enjoy your sabbatical. I also have a soft spot for Art Nouveau. The asparagus is up in the garden, I have foie in the freezer, and a friend gave me a few bottles of Sine Qua Non's dessert wines a few years back, so I'm thinking about a version of this in the near future using my regular old tart crust. Yours look lovely. Enjoy your break! Love these tarts they are just perfection!!!!! I always enjoy your stories! Your tarts look wonderful, especially with the violets. I ought to use mine, instead of letting them be mowed down! So beautiful! Truly I can almost taste and smell it in my imagination, from your wonderful description. 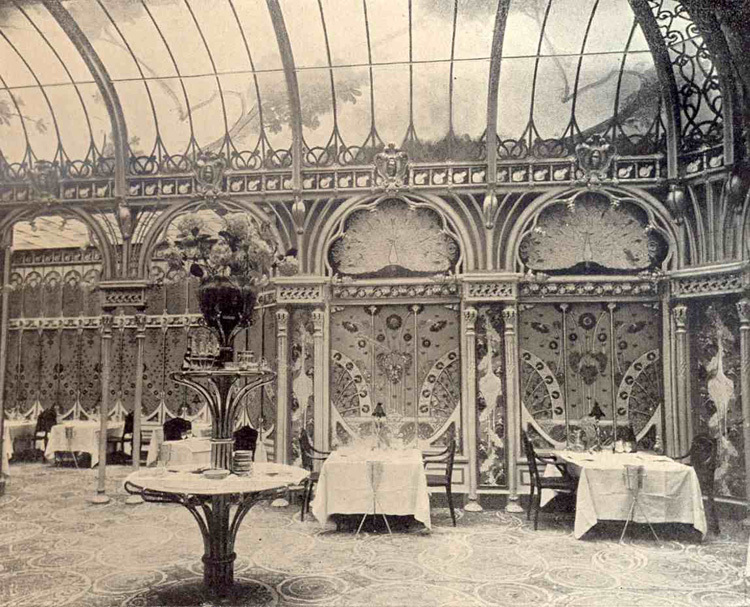 That wine story, and your Parisian memories, too! Lovely interiors! And the recipe sounds delicious. My family loves asparagus in meals. Oh my goodness! You are hands down my new favorite blog. I run a food blog, but your photos are so nicely staged that I almost want to cry with wanting to eat the dishes! Beautifully done, and I'll look forward to reading more! 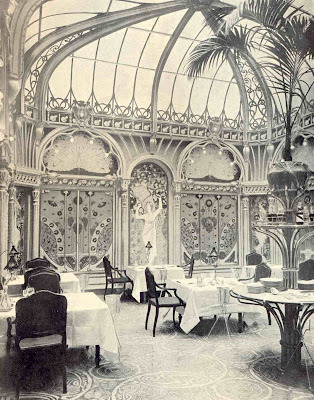 How I wish I had read this post *before* I went travelling - I spent a couple of days in Paris and would love to have sought out La Fermette Marbeuf. As for the dish, what can I say? I had some Tokaji recently (not the 1811 version I hasten to add :D) but am a big fan nonetheless. The overall dish is simply stunning. ps, thanks for the lovely comment ;) Means a lot coming from you! I almost feel like you could give me a happy meal and it'd taste like royal asparagus and foie gras in a dining room like that! How magnificent! But then I was reminded of just how dismal a happy meal really is... Love the detail about the tokaji, in particular. I've never tasted so much as a drop but it's on my list of bottles to acquire - even more so now. I do hope though, that you also treated yourself to a small glass, because as delicious as the asperge en croute looks, I still have a slight prejudice against cooking with such excellent wines. I'm very intrigued with the puff pastries. I will have to try these out soon. Thanks for sharing this recipe.